This kit for couples features a variety of prompts for new "date night" ideas. With this bucket list kit just for couples, you'll never find yourself asking "what should we do for date night?" Printed on a cute collection of birch wood sticks, the date night-invigorating prompts run the gamut from romantic reverie (pack blankets and pillows and go stargazing someplace secluded) to intellectual stimulation (attend a lecture at a local museum or university). Once you’ve shared each experience, note the date on the back of the stick with the official bucket list pencil (provided). Made in the USA. Inspired by her own personal experience and countless conversations with friends, Anne Lopez aims to make a difference in relationships of all kinds. Her motto is simple: Plant seeds of kindness. Harvest happiness. Anne is a graduate of Carnegie Mellon University's Fine Arts department, and earned her MFA in Painting from Cranbrook Academy. She worked as a Production Designer, Art Director and Creative Director for agencies, production companies and corporate clients before deciding to explore an entrepreneurial lifestyle. Anne is passionate about using her creativity to make people happy. She has translated her passion into developing gifts and greetings that make it easier than ever to show you care in creative and thoughtful ways. 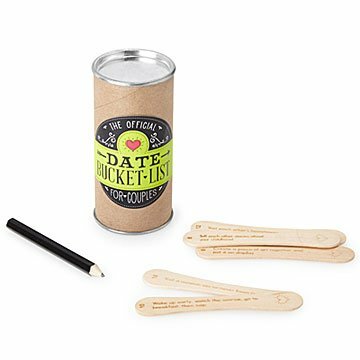 This product is perfect to get to know your partner all over again, and is just super fun. It's perfect for couples' date night's. They are great ideas that are not expensive for date night. Great inexpensive "thinking of you" gift. My son and his girlfriend are young and on a limited budget. They also like adventures. The "suggestions" all look reasonable and like they they would enjoy doing. They found the gift thoughtful. This is a cute gift with some fun ideas. I wish it was a little bit larger or had more ideas for the price. But, the ideas included and the presentation on the sticks were clever. Excellent fun suggestions and memory making opportunities. Wonderful suggestions to spice up date night. Whenever we have a free weekend and we can't think of anything to do, we pull out the little tin and grab a suggestion for inspiration. It's helped us think of other things to do together as well. My friend and her partner LOVED this. They have been trying to grow closer after 7 years together romantically and 50+ years of being friends. It brought them excitement and joy. I want to buy myself and my boyfriend one. They are in their 70s. We are in our 20s. It is a gift for all ages that keeps on giving! We're excited to try this for date nights when we're stuck on an idea of something to do. There were several in there we have not done before! Definitely a cute idea. FYI- It was much tinier than I expected it to be- fits in the palm of my hand!